Thank you for your interest in our Johns Creek, GA law firm. Our Johns Creek Personal Injury practice is focused on helping persons that have been injured in car wrecks and tractor trailer wrecks. 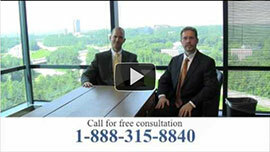 Our lawyers are seasoned trial lawyers and we have tried cases in Johns Creek, Duluth, Norcross and surrounding areas. Johns Creek is a charming city in Fulton County, Georgia, which incorporated Dec. 1, 2006. It is named for a creek that runs through the area. A group of Georgia Institute of Technology graduates bought 1,700 acres of farm land and woods near McGinnis Ferry and Medlock Bridge roads intending to create a high-tech office park in 1981. The city was created out of the northeastern part of unincorporated Fulton County and is bounded by the City of Roswell to the west and south, Alpharetta to the northwest, Forsyth County to the north, and Gwinnett County to the south and east. Our lawyers specialize in personal injury and we do not handle any claims other than injury claims in the Johns Creek metropolitan area. We have over 40 years of combined experience and we are proud to assist you in your personal injury claim. If you are not able to come to our location we will gladly meet you at your home or another location convenient to you to discuss your claim. Our results speak for themselves!